In December last year, we have proved one case of the Inscribed Angle Theorem. In this post, we prove the second case. Note that the order of the cases does not matter; we just placed ordinal numbers to distinguish one from the other. Recall that the first case of the theorem involved drawing an auxiliary line. We drew a line segment passing through the center. In this case, one of the sides of the triangle is passing through the center, so it is not possible to repeat this strategy. However, we will use another line to prove the theorem. 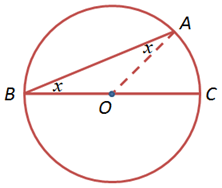 Angle is inscribed in circle . If we let the measured of these angles be equal to , then by the Exterior Angle Theorem, . 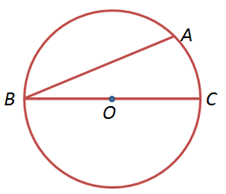 Since the measure of an arc is equal to the measure of its central angle, which is equal to twice the measure of . which is what we want to prove. Note: In the notation above, means measure of arc .